Ever since it was created two years ago, Pioneer One has blazed new trails for Web-based TV. The poli-sci-fi drama not only attracted a cult following (its been downloaded 4 million times and counting) and received critical accolades including “Best Drama Pilot” at 2010′s New York Television Festival (plus a recent nomination for the “People’s Voice” Webby Award), but the show also proved that the Web is a space where TV producers can create new franchises from the ground up. We were lucky enough to catch up with the show’s co-producer, Josh Bernhard, to discuss the benefits of using our distribution platform, which political events inspired the series, his advice for aspiring television producers, and much more. BT: Why did you decide to work with BitTorrent vs. another distribution platform? JB: BitTorrent seemed like an untapped resource. There are already existing communities based around sharing files using the BT protocol and it seemed like no one was catering specifically to them. And because of that, there was an opportunity to stand out. BT: What were the advantages of using BitTorrent? JB: Well firstly, of course, BT is a very efficient way of disseminating large files. Also BT users are tech-savvy who are actively, rather than passively, seeking out content. BT: What were the challenges you faced using BitTorrent? JB: The main challenge was educating the non-tech-savvy about the technology, which is why we also had alternate streaming options on sites like YouTube. But BT was our primary distribution venue and where the overwhelming majority of our viewers came from. BT: How does the model you chose for distribution compare to that of traditional television? JB: Well TV is becoming less and less of an “appointment” medium, and more of a watch-at-your-convenience medium with DVRs and other so-called time-shifting options. And they’re struggling to catch up. I think distributing through BT is ahead of the curve, because while traditional television is struggling to keep apace, we’re already debuting in the medium where most people are getting their content in the first place. BT: What were the obstacles of working with the BitTorrent ecosystem? JB: Mainly because there are so many communities with different ways of working, it was getting everyone to launch our episodes at the same time. But that was mainly handled by VODO. BT: How did you come up with the name Pioneer One? JB: It sounds like we made it up for marketing purposes, doesn’t it? That was entirely coincidental. ‘Pioneer’ has to do with being the first to Mars, as does the ‘one’, which also refers to the Yuri character who is alone. My first thought for a title was Life on Mars, but that was unfortunately taken already! BT: This is a science-fiction series but there are definitely some deep, underlying political currents surfacing throughout the first season. What real-life parallels did you draw from? What international events inspired your storyline? JB: Actually, we do think of the show as a political drama, albeit with a sci-fi premise at its core. One thing that greatly influenced me during the gestation process for Pioneer One was the healthcare debate in the US circa 2009. Whatever your politics, the whole thing just really exposed how ideology can make facts transmutable. It seemed as if an event like a cosmonaut returning from a secret mission to Mars wouldn’t just be accepted so readily, that the biggest obstacle he would have to deal with would be human politics rather than the journey itself. BT: Tell us about season two, Control. Why that name and what are your plans? JB: Control is not season 2 of Pioneer One. While it has origins as part of the P1 universe, it has no direct connection to the show. Our plan is to make this pilot for the 2012 New York Television Festival, where the Pioneer One pilot won for Best Drama in 2010. The idea is to make something to shop to networks and buyers, and is part of our strategy to getting season 2 of P1 made by attracting attention from the right people. BT: You used Kickstarter to raise an initial round of funding in April, 2010 for the pilot and now you’re utilizing them again to fund season two. What attracted you to their service and is this the definitive solution you’d recommend to others looking to create a TV series? JB: Kickstarter is great for just that–kickstarting a project to life. I’ve seen web series successfully fund new seasons from their fans using the service–most notably season 2 of Jane Espenson’s Husbands, but I think that’s more the exception than the rule. I think it’s a great way to get a first episode made as a proof of concept, which is our plan for Control, and was our original plan for Pioneer One. What happened with P1 was the response was so large and we pulled in so much money afterward from donations through VODO that we realized we could make the rest of the first season. That said, I could be completely wrong! There are no rules when it comes to this stuff. BT: What’s the best piece of advice you have for aspiring filmmakers? JB: Don’t wait. Make films. However you can. You’re never going to be 100% ready or 100% happy. The only way to get closer to achieving your vision is by having the experience of doing work. BT: How much, in your opinion, has social media contributed to your success? Which platforms do you recommend the most for connecting with your fans? JB: Social media has been key in our success. It’s our primary medium for connecting with our fans and getting the word out. The usual suspects are Facebook and Twitter, which we’re still using to great effect. BT: Thank you for your time, Josh. We can’t wait for Control. 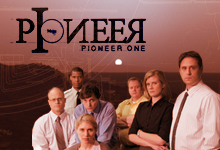 To find out everything you need to know about Pioneer One, visit http://pioneerone.tv. Don’t forget to show your support for their brand new series, Control, by backing it on Kickstarter. This entry was written by BT, posted on April 17, 2012 at 4:26 pm, filed under Uncategorized and tagged control, control kickstarter campaign, control new york television awards, josh bernhard, josh bernhard closer, josh bernhard pioneer one, new york television festival, peoples voice webby award, Pioneer One, pioneer one bittorrent, pioneer one kickstarter, pioneer one web-based tv series, pioneer one webby award, watch pioneer one, web-based tv. Bookmark the permalink. Follow any comments here with the RSS feed for this post. Post a comment or leave a trackback: Trackback URL.